Does writing social media captions make you nervous? Stress you out? Give you big thrills? If you’re like most business owners, you know you need to have good copy, but you’re not quite sure what “good copy” actually means. This is especially important in social media. Have you ever perused Instagram and thought to yourself “Neat… but I don’t care” or simply scrolled past because something didn’t quite “catch your eye”? We’re all guilty of this. And we’ll all keep doing this. Not every post can be life-changing, and that’s ok. 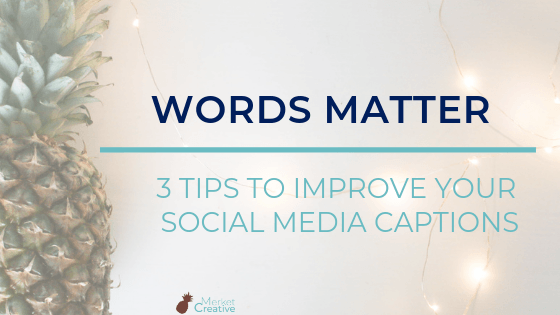 Here are three tips you can use to make your social media captions and copy more effective! But here’s the thing: Easy, selfish copy doesn’t convert. If you’re not sure how to write a caption for social media, think about it this way: Why should your followers care? If you can’t answer that question, it’s time to take a look at why you’re posting what you are. If you understand why your followers might care, though, writing captions becomes SO much easier! Provide value by asking good questions, sharing humor or entertainment, or educating and informing in a way that lifts. This is another mistake that is similar to the You vs I conversation. If you are always talking TO your followers, you’re missing out on a huge opportunity to LISTEN!!! When I do strategy sessions with my clients, one thing we discuss is a listening strategy – how are you going to hear your people? How are you going to understand their concerns and questions? Be sure you have a plan to listen. And ask questions that encourage interaction. Follow hashtags. Engage in conversations others have started. Remember – social media is SOCIAL. It’s about people. The last trick to remember when writing copy for social media is to be clear before cute or clever. A confused customer doesn’t engage and doesn’t buy. It’s so easy for us to say no. We have every reason to NOT engage. As business owners, our challenge becomes getting people to engage. So be clear. Be CLEAR. Clear is kind. Remember to talk ABOUT your customers. What’s your favorite social media copywriting trick? Let me know in the comments below! Interested in improving your social media? Join us in the FREE group IntAct Social, where you’ll learn to do social media on purpose!